A public footpath leads from the house and farmland where you can see spectacular views of the surrounding hills. Centrally situated offering a beautiful location for a relaxing holiday touring the sites and reservoirs of the Elan Valley with its magnificent walks where Red Kites are frequently seen gliding across the skies, or even visit the Red Kite Feeding station nearby. 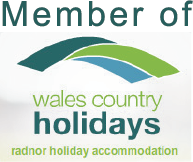 The area has much to offer including horse riding, canoeing, Bowls, Llandrindod Wells Golf Club, Cycling and Walking. Local public footpaths and the Wye Valley walks provide the immediate area with sensational views of surrounding hills and whilst walking many species of wild life can also be seen. Close proximity to the Bowling Greens in Llandrindod Wells and National Cycle Museum collection.